The House of Representatives Electoral Tribunal (HRET) complies with the conditions of good governance and the requirements of Philippine Transparency Seal as set by National Budget Circular 542 issued by the Department of Budget of Management and as provided for in the General Appropriations Act. The Senate and the House of Representatives shall each have an Electoral Tribunal, which shall be the SOLE JUDGE of all contests relating to the ELECTION, RETURNS, and QUALIFICATIONS of their respective Members. Each Electoral Tribunal shall be composed of nine Members, three of whom shall be Justices of the Supreme Court to be designated by the Chief Justice, and the remaining six shall be Members of the Senate or the House of Representatives, as the case may be, who shall be chosen on the basis of proportional representation from the political parties and the parties or organizations registered under the party-list system represented therein. The senior Justice in the Electoral Tribunal shall be its Chairman. the uncompromising criterion of JUSTICE. as mandated by the Constitution. 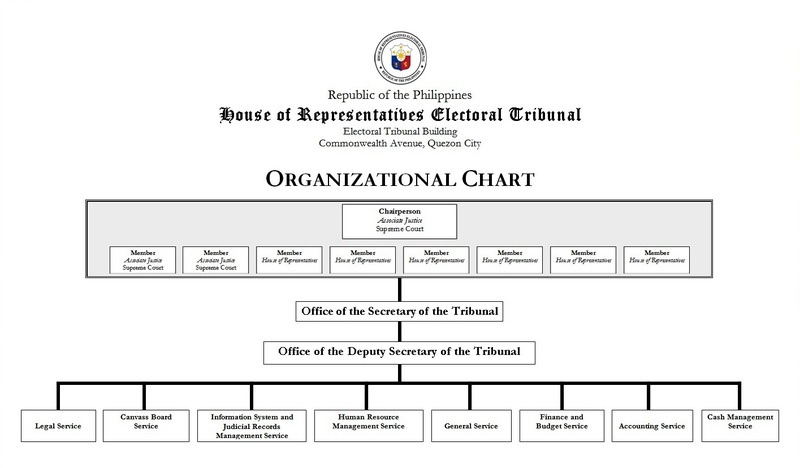 Rep. Joaquin M. Chipeco Jr.
See HRET Organizational Chart here. published by the Commission on Audit (COA), is available here.